19 1/2 x 25 1/2 inches. Antoine Bouvard was born in the South of France at St. Jean-de-Bournay in L'Isere in 1870. He trained as an architect and studied under Constant-Dufeus at the Ecole des Beaux Arts in Paris. He was appointed Director of Architectural Services for the Seine and was responsible for the construction of the Bourse du Travail and the Boulevard Morland in Paris. 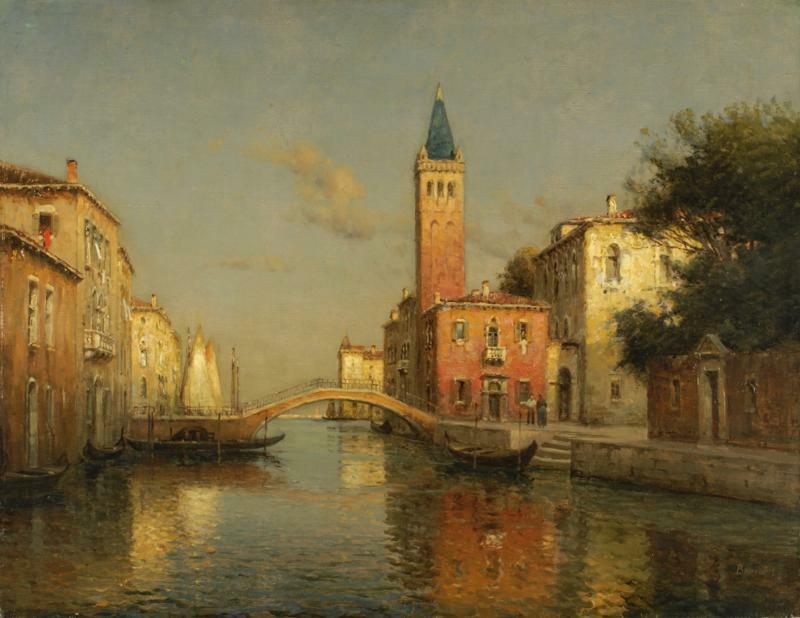 Antoine Bouvard became one of the most popular and internationally collected painters of Venice, his favourite subjects being the canals and backwaters of the city. His work shows the influence of Felix Ziem in the warm colours and fluidity of brushwork but Bouvard was unique in his ability to capture the essence of the place. The artist is known to have painted under his own name and frequently under the pseudonym Marc Aldine.